Reading the review again, I realized that it falls squarely in the main line of epic takedowns that begins with Mark Twain’s “Fenimore Cooper’s Literary Offenses.” This is a piece that was probably ruined for a lot of readers by being assigned to them in high school, but it deserves a fresh look: it really is one of the funniest and most valuable essays about writing we have, and I revisit it every couple of years. Like Amis, Twain begins by quoting some of his target’s puffier critical encomiums: “The five tales reveal an extraordinary fullness of invention…The craft of the woodsman, the tricks of the trapper, all the delicate art of the forest were familiar to Cooper from his youth up.” (In response, Twain proposes the following rule: “That crass stupidities shall not be played upon the reader as ‘the craft of the woodsman, the delicate art of the forest’ by either the author or the people in the tale.”) Both Twain and Amis are eager to go after their subjects with a broadsword, but they’re also alert to the nuances of language. For Amis, it’s the subtle shading of pretension that creeps in when Harris writes “purchases” instead of “buys”; for Twain, it’s the distinction between “verbal” and “oral,” “precision” and “facility,” “phenomena” and “marvels,” “necessary” and “predetermined.” His eighteen rules of writing, deduced in negative fashion from Cooper’s novels, are still among the best ever assembled. He notes that one of the main requirements of storytelling is “that the personages in a tale shall be alive, except in the case of corpses, and that always the reader shall be able to tell the corpses from the others.” Which, when you think about it, is even more relevant in Harris’s case—although that’s a subject for another post. Note: This post is the twenty-sixth installment in my author’s commentary for Eternal Empire, covering Chapter 25. You can read the previous installments here. Whoever absorbs a work of art into himself goes through the same process as the artist who produced it—only he reverses the order of the process and increases its speed. What’s true of a chapter is also true of a larger section, except on a correspondingly grander scale. I’ve said before that when I start working on a novel, I usually know all of the major act breaks in advance, but that’s only half correct: more accurately, I have a handful of big moments in mind, and I know enough about craft to want to structure the act breaks around them. A major turning point that occurs without propelling one section into another feels like a waste of energy. (Any good novel will have more than three or four turning points, of course, but you intuitively sense which ones deserve the most prominent positions, and build the rest of the story around them.) There are times, too, when I know that a section break ought to occur at a certain position, so the scene that leads into it has to be correspondingly built up. A moment of peril, a cliffhanger, a sudden surprise or revelation: these are the kinds of scenes that we’ve been taught to expect just before a section ends. Sometimes they can seem artificial, or like an outright cheat—as many viewers felt about the end of a recent episode of True Detective. But if you learn to honor those conventions, which evolved that way for a reason, while still meeting the demands of the story, you often end up with something better than you would have had otherwise. Which is really the only reason to think in terms of genre at all. Note: This post is the fourteenth installment in my author’s commentary for Eternal Empire, covering Chapter 15. You can read the previous installments here. Yet as Borges says in “The Garden of Forking Paths: “Everything happens to a man precisely, precisely now. Centuries of centuries and only in the present do things happen.” That’s as true of fiction as it is of life, and for the most part, the past can’t be allowed to overwhelm the story from one moment to the next. Most of us, after all, rarely reflect explicitly on the events of our own lives, once they’ve been buried deep enough: our memories shape us, but in subliminal ways, and just because our choices are influenced by the ones that came before doesn’t mean we’re aware of it. Stories of any complexity need to selectively impose the same kind of amnesia, both for realism’s sake and as a strategy for managing information. (If anything, many of the protagonists in modernist fiction tend to be more aware of the past than is psychologically plausible: it’s a convention of the genre, allowing the author to introduce material from before the story began, while gently departing from the way most of us actually think.) A show like The Vampire Diaries, which generates and discards an insane amount of plot, technically retains a memory of previous seasons, but employs it purely as a matter of convenience. If it can use it to justify the arbitrary moves of the characters in the current episode, great; if not, it’s as if it never happened. I’ve had to confront these problems repeatedly in my own work, and with mixed results, partially because I was learning so much of it on the fly. These were always going to be complicated novels: The Icon Thief was largely about complexity, with multiple plotlines and connections to the past, both factual and invented, and the next two books had to follow the same template. What I didn’t fully anticipate was the extent to which they would have to deal with the history of the series, as well as their own burden of plot, and at times, the combination became close to unmanageable. It isn’t as problematic in City of Exiles, which introduces a new setting and deliberately leaves a few threads unresolved. But Eternal Empire—which was conceived as a return to the characters and themes of the first book, as well as the conclusion of the series—always felt on the brink of collapsing under its own weight. I’m proud of the result, which I still think is the best novel I’ve published, but I’m also aware that it suffers from a miscalculation about how much of its past to include. It was meant to be novel that could stand on its own, as well a satisfying close to the trilogy, and I’m not sure it is. And given the chance to go back, I would have taken a page from other exemplars of series fiction, like Daniel Silva’s excellent thrillers about Gabriel Allon, and made each book a little more self-contained. 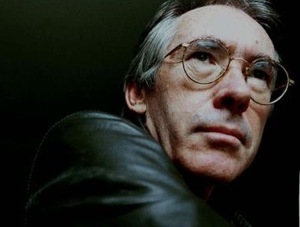 If I were to recommend a single contemporary novelist as a good model for young writers to imitate, it would be Ian McEwan. Part of this is a matter of personal convenience: McEwan, in many ways, happens to represent the peak of the kind of writing toward which I’m constantly striving, and although I can’t come close to him at his best, I’d like to think of him as the platonic ideal of my own approach to fiction. (For the record, I only discovered McEwan after many elements of my own style were already locked in place; I never consciously emulated him, but I realized after the fact that he was better at what I was doing than I was.) Even if you’re writing in a different mode, there’s a lot that he can teach aspiring authors who are still trying to find their own voices. McEwan’s prose is stylish, elegant, but highly accessible: as T.S. Eliot said of Dante, if you imitate McEwan, you may end up with a boring sentence, but you won’t make a fool out of yourself. He understands the value of research, and he’s constantly expanding the range of experience about which he can credibly write. And while he’s not an intensely personal author, his books reflect a consistent set of questions to which he repeatedly returns—the nature of storytelling, the uneasy relationship between the body and the mind, and the contrast between the ideas by which we try to live and the messiness of human interaction. I just finished Sweet Tooth last week, and I think it’s his strongest work of any kind since Atonement. It may, in fact, be a better book overall, and much of it reads as a return—in a slightly lighter vein—to some of the themes and strategies of that earlier novel. 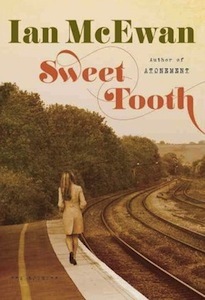 Both Atonement and Sweet Tooth are founded on sustained acts of literary ventriloquism: Atonement moved easily between the perspectives of characters of a variety of ages, genders, and social classes, and Sweet Tooth is partially an exercise in inhabiting the mind and life of a young woman in London in the 1970s. Since I’ve written frequently from a female point of view, this kind of thing interests me greatly, and McEwan pulls it off in a fashion that is both impressive and slightly showy. The homely details are laid in with a degree of care that I’m not sure we’d see in a female novelist, and the entire time, we’re encouraged both to believe in Serena as a character and to marvel at McEwan’s virtuosity as a writer. In another book, this might be a serious flaw, and as much as I enjoyed Sweet Tooth throughout, I was always conscious of the stylistic feat it was performing, which wasn’t the case with Atonement. By the end, however, we realize that McEwan has been one step ahead of us the entire time, and in retrospect, the entire novel seems even more controlled and purposeful than we suspected. That’s the mark of a great writer, and I’ll add one more quality to the mix: McEwan’s humanity. That may seem like an unlikely attribute for a writer whose early books tended to excessive darkness, and whose truest precursor may be the gleefully macabre short fiction of Roald Dahl. Like many of us, though, McEwan has become gentler with time, and instead of a failure of nerve, it reflects a progressively more sympathetic understanding of human life. Sweet Tooth gives McEwan the opportunity to revisit some of his own tricks with the benefit of an additional decade’s worth of experience, and within the confines of a genre that sometimes seems to have little more in mind than putting the reader through the wringer, his decisions—which I won’t spoil here—are immensely gratifying. There are ways in which the ending of Sweet Tooth doesn’t quite make sense, and it’s a little too ingenious for its own good. Still, it’s one that I’m happy to accept, both within the logic of the story and in the larger context of McEwan’s growth as an author. He’s so good at what he does that it’s easy to be jealous of him, but he’s also uncommonly generous at giving us the how as well as the what. This is what all fiction could be, if we had his patience, experience, and imagination, and if his most recent work is any indication, it’s only going to get better from here. When I made Rachel Wolfe a Mormon in The Icon Thief, I had no idea that she’d end up as the central figure in City of Exiles. At the time, as I’ve explained before, I saw it as a convenient way to give her a little more personality, and it provided me with just enough material to enliven a crucial supporting character. Later, when Wolfe was upgraded to the status of lead protagonist, I realized that there were a number of directions in which I could take this particular detail. I could simply retcon it out of existence, or, more reasonably, ignore it as something that wasn’t relevant to the story; I could make her a lapsed Mormon, which might have been thematically interesting in itself; or I could embrace it, making Wolfe a devout Mormon who was unironically smart, admirable, and brave. When in doubt, I’ve learned to go with the idea that seems the most challenging, so I went with the final option. 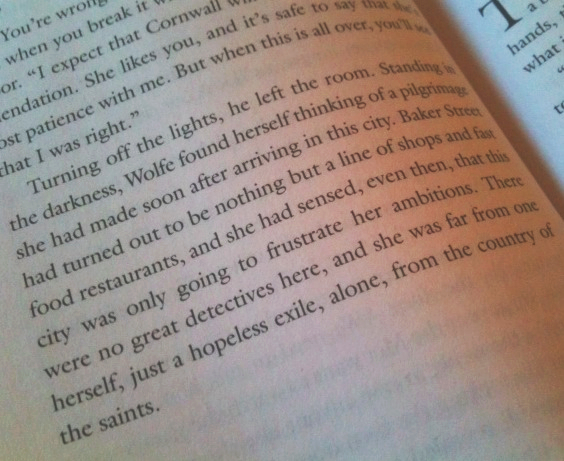 In practice, the novel splits the difference between the last two approaches: Wolfe is serious about the role of faith in her life, but she’s also full of doubt, and although the result may not be as pure as it was in my head, it ended up being better for the novel as a whole, as well as more suited to my personality as a writer. All the same, even if Wolfe was starting to question her religious assumptions, I wanted her to maintain the externals as much as possible. There are aspects of Mormonism that seemed utterly organic to her character as a straitlaced federal agent, and I tried to keep as many of these as I could: the teetotalling, the avoidance of debt, the lack of swearing. It also seemed appropriate to the concerns of the overall novel. City of Exiles is a crowded story with a dense web of themes, not all of them intuitively related, but they all tend to center on the idea of exile itself: national, spiritual, and emotional. 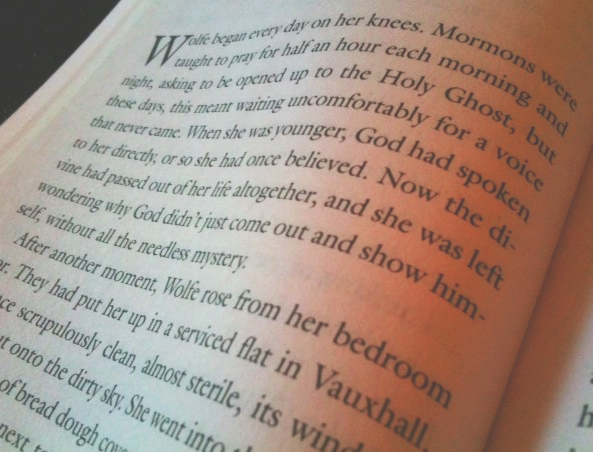 Exiles often maintain a semblance of their old ways long after they’ve experienced a change of address, and it felt right that Wolfe would continue, for example, to pray every morning, although she’s no longer sure if anybody is listening. She’ll always be a stickler for structure, even as she learns to improvise her way around the obstacles the world presents, and it made sense to me that she’d continue to value the ways in which these traditions have shaped her life, long after she’s left the country of the saints. This is why I open Chapter 4 with the image of Wolfe on her knees, an unconscious echo of the kneeling body we saw earlier in the book. I still think it’s a startling introduction: we’ve met Wolfe already, both in the previous novel and in a prior chapter, but this is her real debut as the heart of the story. Before long, we’ll jump back into the plot, which has to cover a lot of ground, but first I wanted to give Wolfe a contemplative page or two to set up her personal journey. I dressed the set as carefully as I could with details that would hint at what her life has been like in London. She’s living in a sterile extended stay apartment in Vauxhall, but there’s a lump of bread dough rising on the counter—a nod, perhaps, to the way she was brought up, and also what strikes me now as an interesting bit of symbolism, although I didn’t see it at the time. She walks to work along the Thames, which, with its muddy, depressing bank, counts as another way the city has failed to live up to her expectations. (I’ve walked the same stretch of the river.) And when she arrives at the office, she’s faced with a choice: prolong a foundering investigation, or cut her losses and take what she can get now. I became a suspense novelist by accident. As I’ve mentioned before, when I first started writing in a serious way, I was drawn less by a genre than by a general idea of the stories I wanted to tell and of how I wanted to spend my time. I wanted to write books set in the present day, and to craft stories that would allow me to explore aspects of the world I didn’t know firsthand: for me, being a writer has always been an excuse to learn things, to read widely, to wander, and to put myself into places and situations far outside my own experience. I also love elaborate plots and layered structures, and I was particularly interested in the problem of momentum—of drawing the reader from first page to last in as seamless a way as possible. It was these factors, rather than an existing love of the form, that drew me to suspense, which sometimes seems like the last refuge in popular fiction of the qualities that matter to me the most: plot, ingenuity, detailed research, pacing, and an prolonged engagement with ideas and systems in the real world. Suspense, of course, is a quality common to all fiction, popular and otherwise: John Updike has spoken of a novel’s “obligation to generate suspense,” and all good stories hinge on the reader’s anticipation of what will happen next, either in the story itself or, more subtly, in the artistic decisions that the author makes. What fascinates me about suspense as a category is how it surrounds its primary obligation to engage the reader with secondary qualities that have emerged, over time, as elements that audiences have come to expect. There’s the issue of violence, for instance, either explicit or implied, as well as the more important quality of anticipation. This goes hand in hand with a certain kind of verisimilitude, in which the author is expected to know the details of weapons and arms smuggling and other arcane facts that contribute less to the narrative itself than to its overall air of expertise. And thrillers tend to return to the same handful of cultures—law enforcement, organized crime, your choice of secret societies—that serve as a sort of scaffolding for a wide range of possible stories. These were all things that I figured out after the fact, once I realized that suspense gave me the most useful set of tools for the kind of intricate, highly structured contemporary fiction I wanted to write. But since publishing The Icon Thief and City of Exiles and putting the finishing touches on Eternal Empire, I’ve started to think more clearly about the genre and its limitations, as well as its potential. On a superficial level, suspense seems like a category for grownups: it avoids the fantastic or paranormal in favor of stories that deliver what feels like real insight, or at least accurate research, about the world in which we live. Yet much suspense fiction is grounded not so much in reality as in a heightened version of it, which feeds us information in as artificial and calculated a way as any kind of worldbuilding. It differs from other genres primarily in that it takes pains to make its fictional world resemble the real one as much as possible, only more orderly and exciting. As a result, much of its interest comes from the way it pushes against the real world while still honoring the conventions of popular fiction. And I still think the genre has enormous potential. 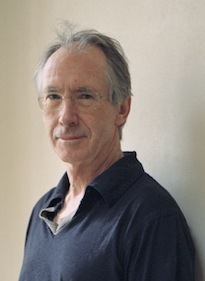 The line between suspense and literary fiction is more porous than in most other categories: I’ve noted elsewhere that a writer like Ian McEwan is essentially a brilliant suspense novelist who is classified as a literary author because of his sheer talent, as well as his focus on everyday life. 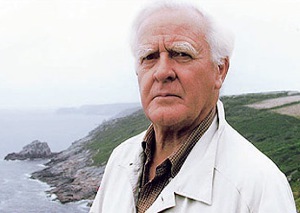 (You could say much the same about John le Carré, whose ascension was long delayed because of his commitment to the structures that I’ve mentioned above.) There’s still a tremendous amount of freedom in the form: within the obligation to deliver action and surprises, an author has enormous latitude to explore, think, and play. Ideally, the conventions of suspense serve as a sort of machine for sustaining the reader’s interest, and the future of the form lies with authors who can build beautiful clockwork toys—which is a tough problem in itself—while also realizing their potential to deliver challenging ideas and characters that would be harder to manage in a less structured story. It’s certainly the genre in which I’m personally happiest. And at its best, its possibilities are limitless.